We lost track of time amidst so many exclusive, limited edition time pieces which were displayed at the Circle of Time event. Since it was the first time five leading luxury watch brands spread out a spectacular haute horlogerie collection, it was a delight to see each of these in person and learn more about such exceptional horological art pieces. Spokespersons and brand representatives of the Bulgari, Hublot, Parmigiani and Ulysse Nardin did their best to update us with their latest collection on display. We regret not being able to meet any representative from Jaeger-Le Coultre however. Take a look at our top picks from the Circle of Time. Bvlgari corner was bustling with more activity and Weiling Wong’s (Managing Director, Bulgari SEA) presence was the highlight of the afternoon. We heard one of the watches tell time like a minute repeater using a code of chimes with the help of gongs and hammers. 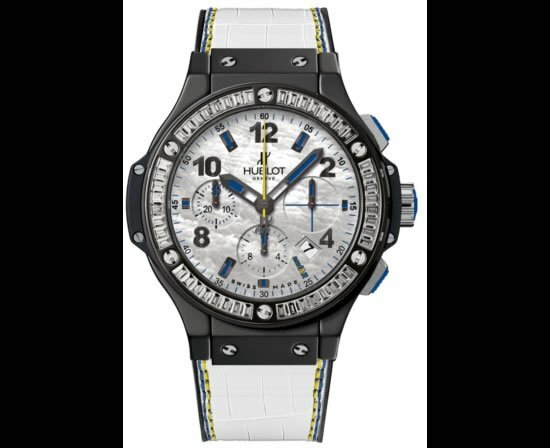 The Bvlgari Gerald Genta Magsonic watch collection caught our fancy. 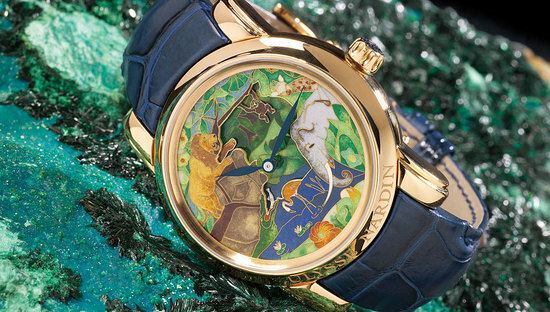 Also the Magsonic Sapphir edition made out of only gold and sapphire is one the most complex limited edition timepiece. 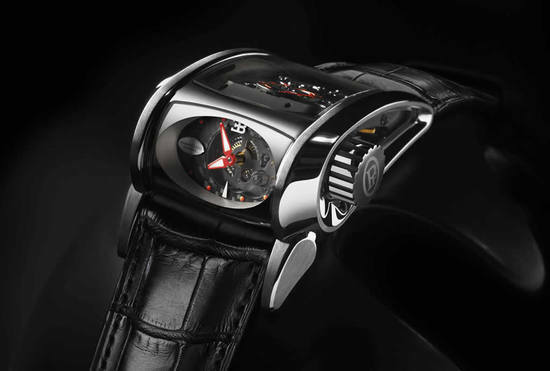 The Bvlgari Gerald Genta Magsonic watch can be ordered for more than $900,000. 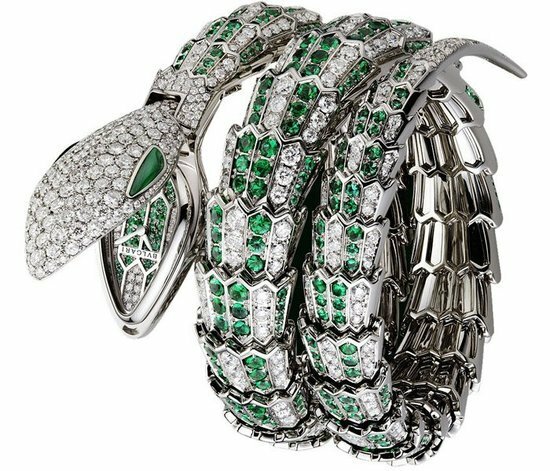 Of all the iconic bejeweled Serpentine collection, we were mesmerized by the one shaped out with white gold which dazzled with 386 diamonds and 388 emeralds on bracelet and on the dial. Its white gold case was set with 172 diamonds and 2 malachites. 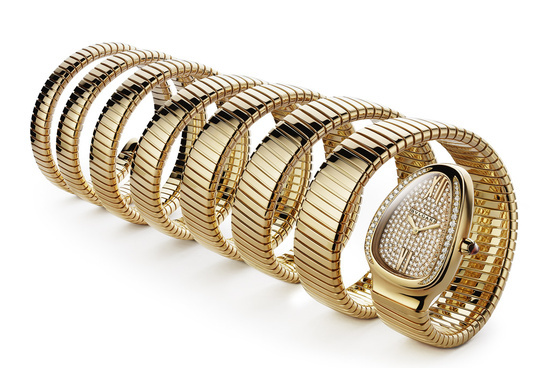 The gold braid of Serpenti 7 coils model is composed of a coil as long as five meters per coil around the wrist, which totals up to 35 meters in rose gold. It sports 228 diamonds. 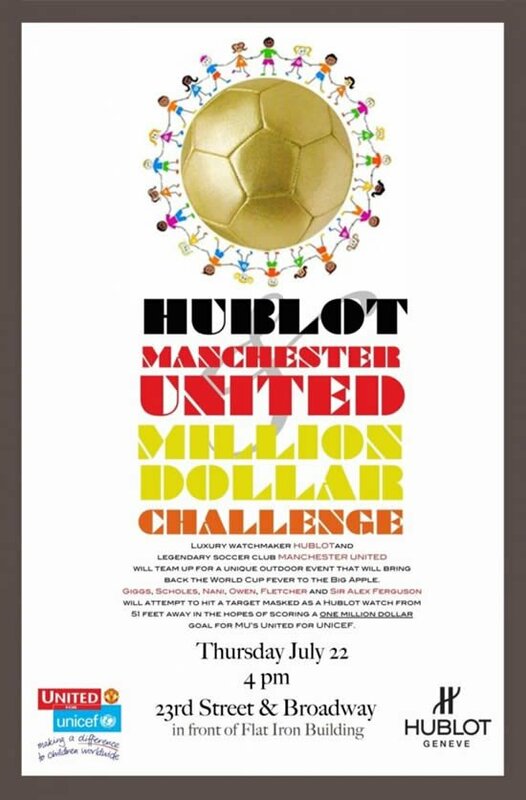 Hublot is luring the youth and is claiming to be the next big thing after Rolex as stated by their representative. 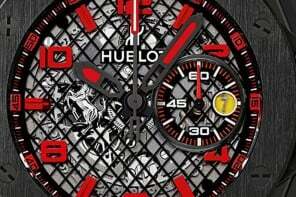 We couldn’t take our eyes of the F1 King Power Tourbillon which is equipped with the Tourbillon chronograph movement HUB7300. Though it sat still on that pedestal inside its case that day, it raced its way into our wish-list. 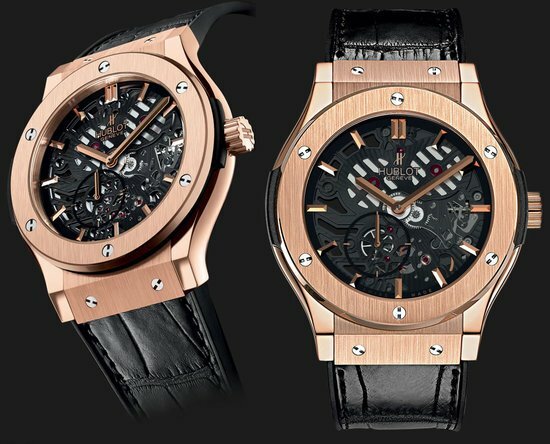 The other watch that fancied our attention is the Hublot Big Bang Vendôme Tourbillon Gold Watch which sports two bronze replicas of the column in Place Vendôme. Jaeger-LeCoultre Calibr’s Duomètre à Quantième Lunaire is a true masterpiece of micromechanics and it is a new interpretation of the revolutionary ‘Dual-Wing’ concept. It features two independent power reserves, one of which is devoted solely to precise time measurement while the other takes care of the functional displays. 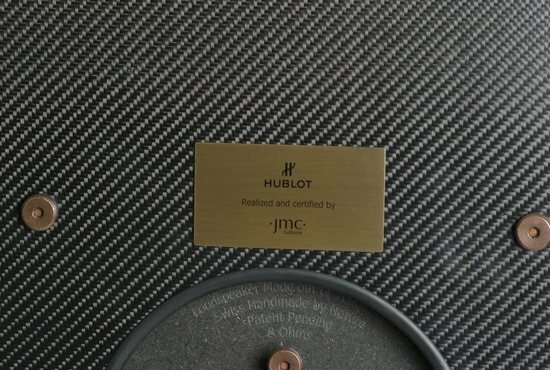 Jaeger-LeCoultre Master Compressor Extreme LAB 2 also stood out as an extreme timepiece as it is equipped with a completely new mechanical chronograph movement specially designed for the most extreme environments. 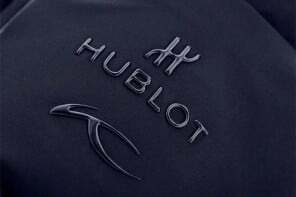 It is probably the only brand in the work which is still lead by the founder designer. 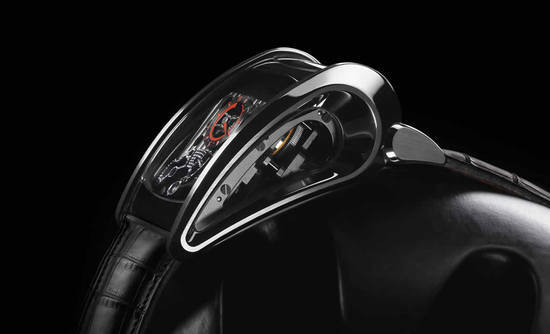 The Parmigiani Bugatti Type 370 is a stunner with its form as well as function. 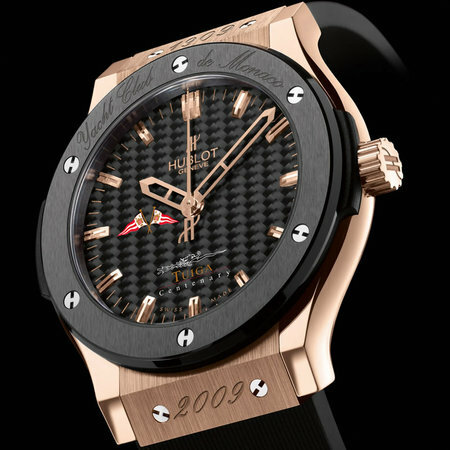 The design is such that the dial is facing the wearer at an angle on the wrist. 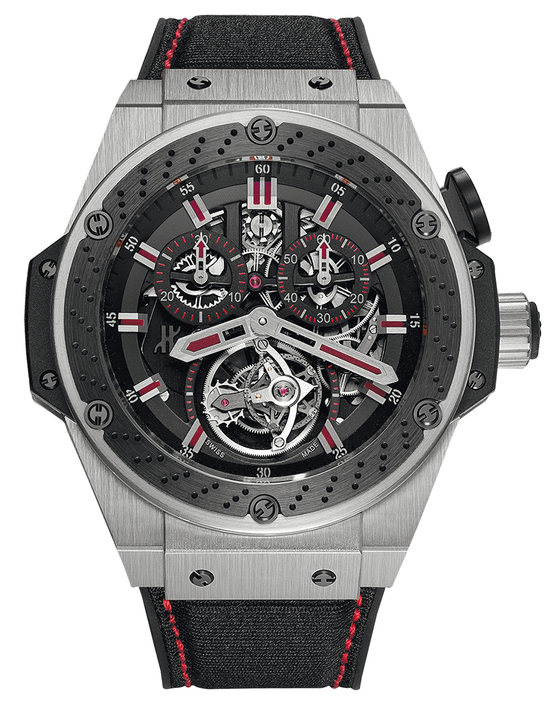 The top of the watch offers a detailed view of the movement and power reserve indicator. 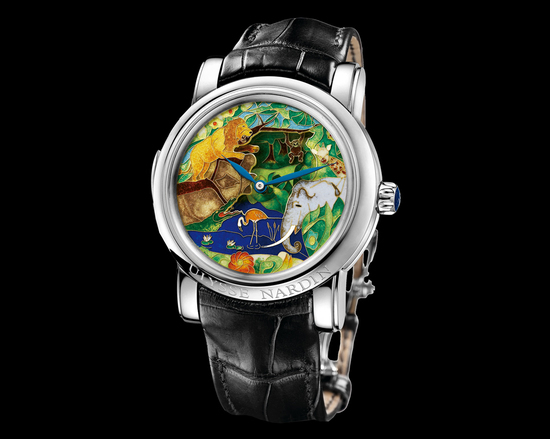 Such a watch certainly challenges the codes of haute hologerie. 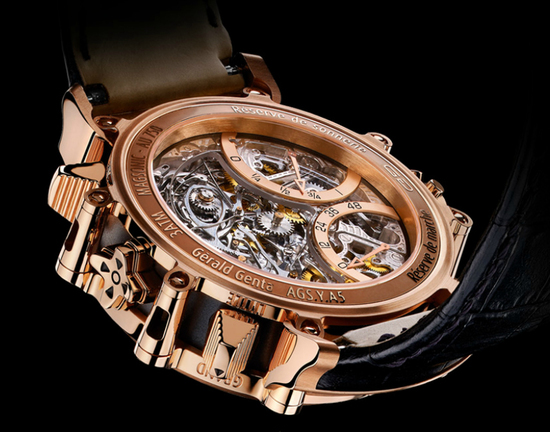 The movement is placed at a diagonal angle and it’s covered with crystal on all six sides which enables every part of its mechanical universe to be observed. Sporting Hermes straps, Parmigiani watches make almost all of their own watch movement and case components. This edition is limited to 3 x 50 pieces and 1 x 10 pieces and flaunts a $280,000 plus price. 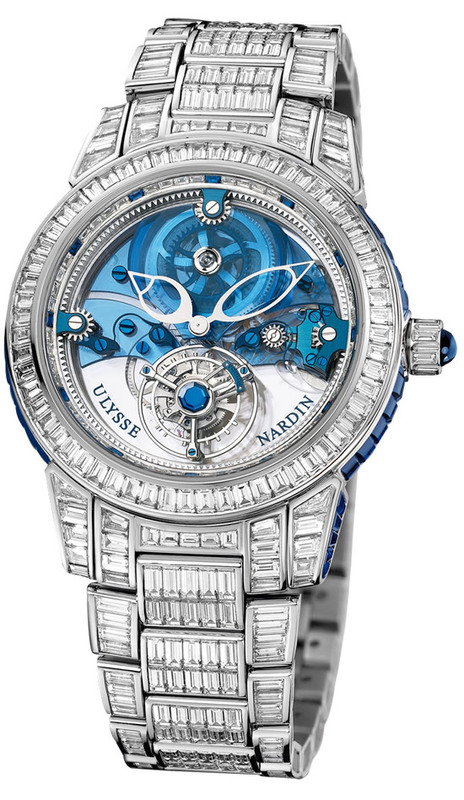 Ulysse Nardin Royal Blue Tourbillon Haute Joaillerie is limited to 30 pieces in platinum. 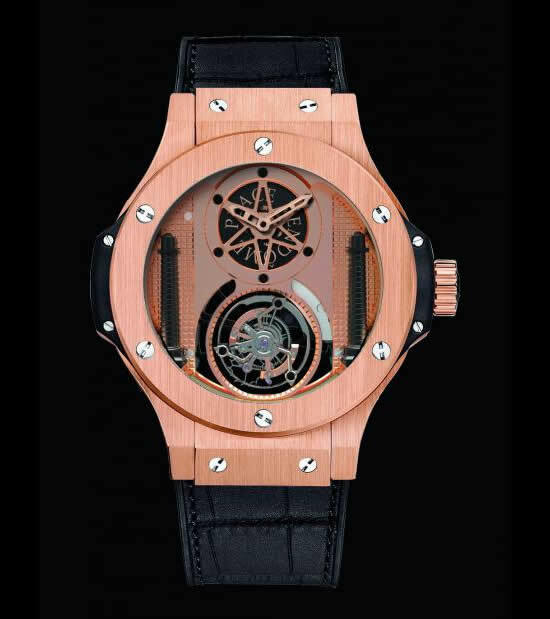 It sports a winding of the movement through a circular rack mechanism. 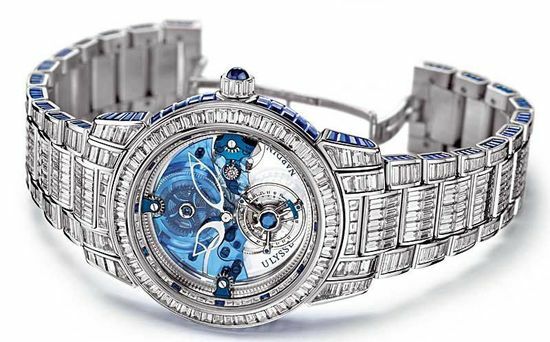 The timepiece flaunts a total of 568 diamonds and 234 cut royal blue sapphires. 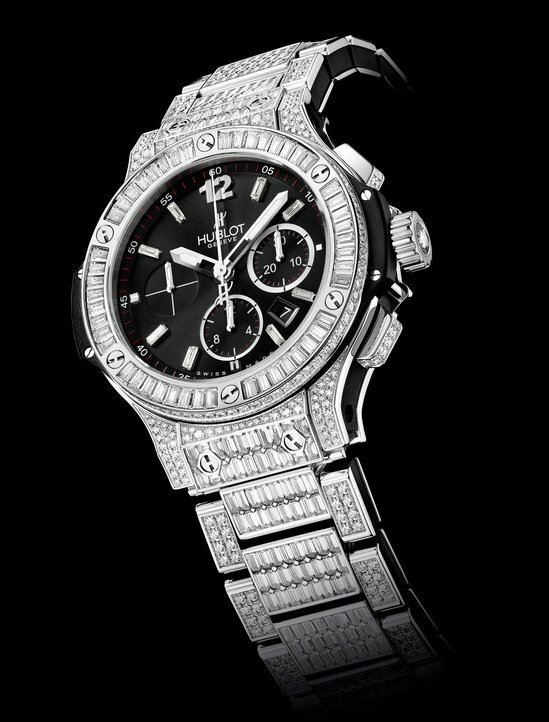 The 43 mm dial is set with 128 diamonds and 57 blue sapphires. The dazzling platinum bracelet is set with 432 diamonds and 176 blue sapphires. The crown is embellished with 8 diamonds and 1 cabochon sapphire. Price is revealed on request. 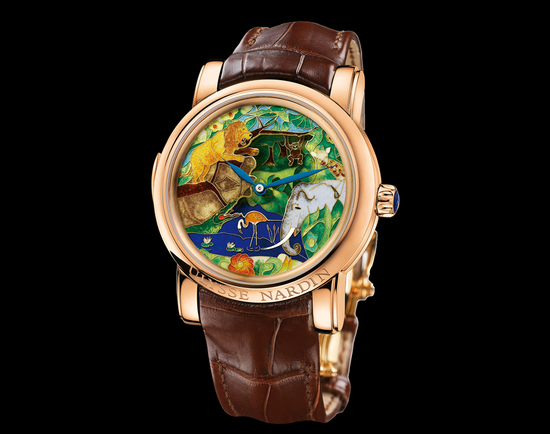 Another Ulysse Nardin timepiece that charmed us is the Safari Jaquemarts Minute Repeater which is fitted with 2 cloisonné dials giving it a 3 dimensional appearance. They are mounted such as to reveal a little fish being caught in a crocodile’s jaws. 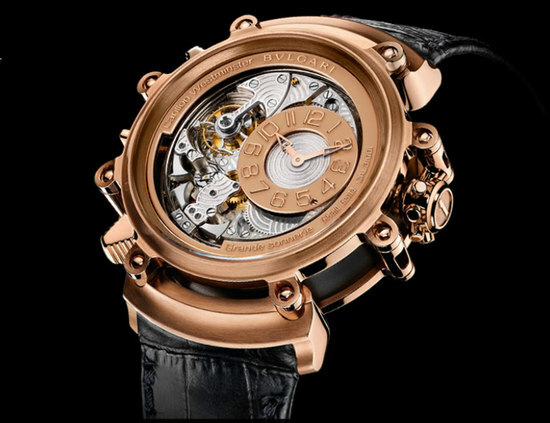 Activation of the minute repeater lever causes the lion’s paw to stretch forward and reach for the monkey. The monkey swings back and forth from his branch. The price is on request. As we all race against time, these few pieces of perfection made us stop, pause and watch.